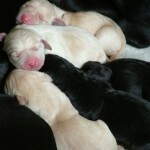 On the 18/04/2009 Karl and Tracey Sawyer had a fantastic healthy litter of black and yellow Labrador puppies born. Gemma (mother) had a fantastic birth with no complications. Gemma gave birth to 6 huge puppies weighing an average of 500g. 2 yellow girls, 1 yellow boy, 2 black boys and 1 black girl. One thing Karl and Tracey were hoping to do is produce a traditional litter of Labrador retrievers with good size and plenty of bone to their structure but also with fantastic working ability. Although its early days from what i have already seen they are certainly ticking most of the boxes already. The father to the litter is non other than our fantastic looking Moss . Gemma has a good working pedigree including some strong lines including Flashmount, Pocklea, Drakeshead, Dargdaffin , Palgrave, Millbuies and many more. 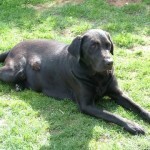 Gemma is also hip scored and holds a current clear eye certificate.